People saw in Prime Minister Narendra Modi a leader they had been waiting for the last 70 years, BJP chief Amit Shah claimed Saturday and asserted that this Lok Sabha polls will be fought only on the issue of who will lead the country. Addressing a rally here before filing his nomination papers for the Gandhinagar Lok Sabha seat, he said the BJP was his life, and also recalled his journey -- from being a party worker in 1982 to becoming its national president. Shah has replaced BJP veteran L K Advani, who had been winning uninterrupted from Gandhinagar since 1998, from the prestigious constituency. The BJP chief is contesting the Lok Sabha poll for the first time. Union ministers Rajnath Singh and Nitin Gadkari and leaders of NDA allies, including Shiv Sena chief Uddhav Thackeray, SAD supremo Parkash Singh Badal and LJP founder Ram Vilas Paswan were present on the stage with Shah at the rally. "This election will be fought on only one issue, and that is, who will lead this country? When I ask who will lead the country, from Himachal to Kanyakumari and from Kamrup to Gandhinagar, only one word is heard, that is: Modi, Modi, Modi," Shah said. "Why was this trust formed in just five years? Why has a Gujarat chief minister, who had not even contested a panchayat election before becoming the chief minister, became the favourite of the entire country in just five years? It is because people saw in Narendra Modi a leader that they had been waiting to have for the last 70 years," he said. Shah claimed that only Modi, the BJP and the NDA government can assure security to the country. "The question before the country is who can assure security to the country? Only one person, only one party can assure this. Prime Minister Narendra Modi, the BJP and NDA government can assure security to the country," he said. 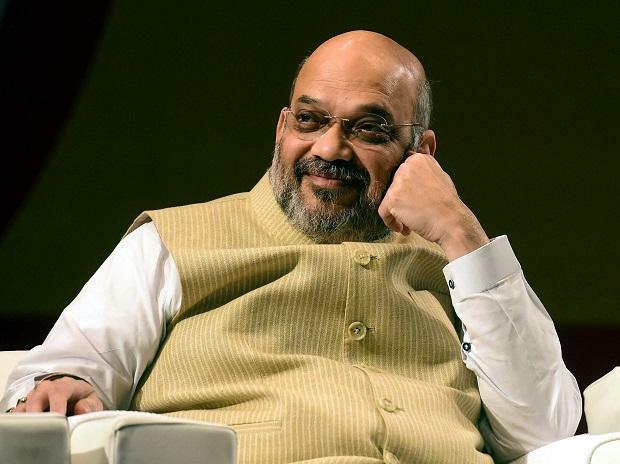 Shah said he was fortunate to file his nomination papers from Gandhinagar seat, which was earlier represented by leaders including Advani, Atal Bihari Vajpayee and Purushottam Ganesh Mavlankar. He said he was an MLA for five times from the region, which falls under the Gandhinagar Lok Sabha constituency. "I am fortunate that BJP has made me the candidate from Gandhinagar seat that was represented by Lal Krishna Advani, Atalji and Purushottam Ganesh Mavalankar. It is this region from where I was elected MLA for five times. From this region, I successfully did electoral politics with your support," he said. Asserting that he would carry forward Advani's legacy once he gets elected from the Gandhinagar parliamentary constituency, Shah said, "Development of Gandhinagar seat is the commitment of all of BJP party workers. "Today, Gandhinagar seat is among the most developed seat in the country and I will humbly and from the bottom of my heart try to carry forward the legacy of Advaniji," he said.